Cutting his teeth as a battle DJ in the late 80s, Hype's ferocious talent on the decks has been proven time and time again. The man behind the immediately popular Ganja Records and a fundamental part of the d&b institution which is Playaz, Hype's influence can be found all over the d&b scene which he has championed from 90s pirate radio to today's sold-out clubs. Signed to the Playaz label, Hazard's uncompromising and totally unashamed take on jump up drum & bass has placed him at the very forefront of the field. With a slew of anthemic, earth-shaking tunes to his name, there's not much out there that can hold a candle to the feeling you get when 'Mr Happy' kicks in. If you've been DJing since the 80s, there's a fair chance you'll know what you're doing by 2014, but few could predict just how essential Randall would prove to be. Championed as a key influence by Andy C and Friction to name just two, Randall still means business - he will be shaking the foundations with a jungle set. One of a select few DJs who has achieved legendary status without major production credits, Bailey played his first Metalheadz show in 1995, and he is still a resident now, 19 years on. That staying power points to his absurd ability on the decks, where he has been described as an 'alchemist'. 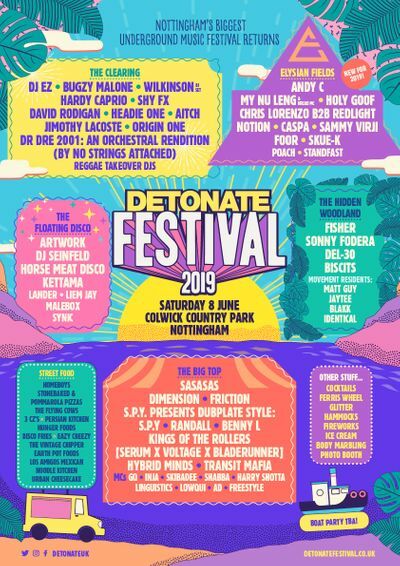 Detonate founder Transit Mafia has lived drum & bass for considerably longer than the 15 years his brand has been running. Those 15 years have been crammed with DJ sets dedicated to the genre, but this one will be a little different as he charts Detonate's progress from inception to the present day from the decks. This special one-off Detonation event will run 11pm - 5am at the Marcus Garvey Ballroom in Lenton, Nottingham.